Manufacturing and Trading of Healthcare products. 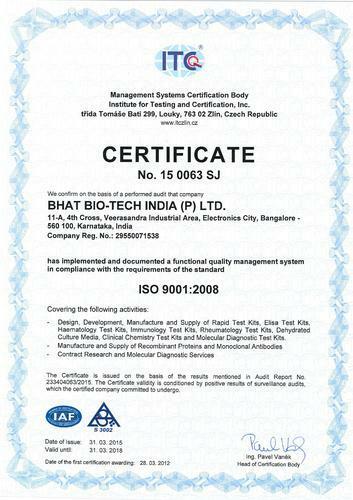 Bhat Bio-Tech India (P) Ltd was incorporated in the year 1994 and carved a niche as the known manufacturer, exporter, supplier & importer of Health Care Products. We have introduced Rapid Test Kits, Elisa Test Kits & Serology Test Kits. Our products are widely known for the features such as superior quality, reasonable prices. Manufactured from superior quality material our range stands high in terms of quality. We are supported by the team of trained and skilled staff, having years of industrial experience in the respective domain. Our team consists of Quality Assurance, Manufacturing, R&D, Finance, Administration, HR, Warehouse, Sales and Marketing. Seminars, Workshops and Training sessions are arranged by us on regular basis, so that we can keep our professionals aware of the current market trends. Hi-tech infrastructural facility is developed by us, which enable us to carry even bulk production with great ease. Machines based upon modern technology are installed in our manufacturing unit, which ensure smooth and prompt production in minimum time frame. Besides, these machines are sent for servicing on regular basis, in order to enhance their service life. Our infrastructure is segregated into varied units such as quality testing unit, R&D unit, manufacturing unit, administration unit and a spacious warehouse. Dr. Shama Bhat has guided us to achieve the pinnacle of success. His dedication and hard work has made us stand among the leading market players. We export our products in Globally & import from US & Europe. Our well-equipped infrastructure enables us to provide support us to offer superior quality products to the clients. We are backed by experienced staff and latest equipments, which enable us to carry our tasks in an efficient manner. Facility of 40,000 square feet is added to facilitate manufacturing unit, training department and unit. Our team comprises marketing executive, administrative staff and customer care team. The vision shared at BBI is the continued development of company with a global reach, capable of penetrating each market, fueled by a constant flow of quality products, which provide innovative and affordable solution to customers. Bhat Bio-Tech Mission is to establish a company for Diagnostics, Molecular Diagnostics, Drug Discovery, Bio-Pharmaceuticals and Biotechnology based products for industry and healthcare. The products should be affordable to common man in India and elsewhere in the world. 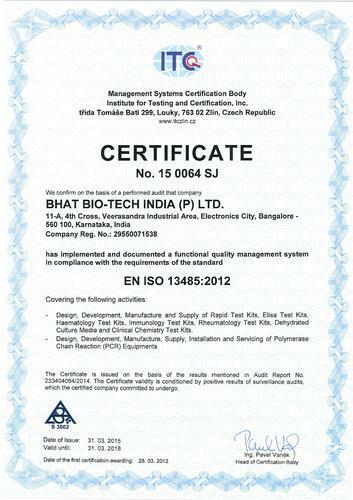 As a socially responsible organization / industry, Bhat Bio-Tech is investing its resources in socially relevant projects. We have initiated a financial support system to the children of our employees for their education. We have adopted a nearby school and we provide financial assistance to the students of economically backward classes. We have also instituted several scholarships in colleges to the economically backward and bright students. We also identify the deserving students and provide them with financial assistance for their education. ISO 9001: 2008 CERTIFICATE Company. EN ISO 13485:2012 CERTIFICATE Company.